In May 2015, KS Energy Services crew members started working on a project to lay 2,400 feet of pipe under the Ohio River near Cincinnati. KS was a subcontractor on the project for Michels Corporation which was contracted by Duke Energy to replace two natural gas pipelines that were originally installed in 1947. 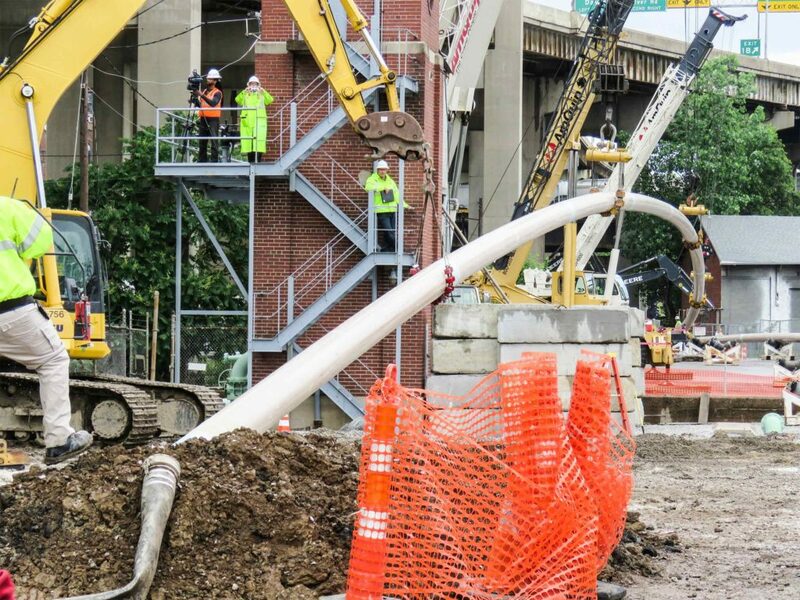 The new pipe runs approximately the length of 7.5 football fields and was placed 140 feet below the surface of the river between Cincinnati, OH and Covington, KY.
Our KS crew supported the bore shot, handled the pipe, completed welding and coating, and assisted with pull back. We also conducted hydrostatic tests for Duke and Michels. Handling and moving the half of a mile long and sixteen inch diameter steel pipe required enormous care and patience. Our crews used three cranes working together and supported the load in between the cranes using excavators. The pipe was laid in place as of the beginning of June 2015 and our crews finished the project with tie-ins on both sides of the river.